You may already know about Honduras for its miles and miles of pristine Caribbean coastline, or for the popular Bay Islands just off the mainland. Trujillo is a colonial town rich in history and is home to the native Garifuna, Miskito and Pech cultures; enveloped by the raw and exotic beauty of the Capiro-Calentura National Park and the Guaimoreto Lagoon Wildlife Reserve. You will hear stories of pirates, banana plantations, see waterfalls, rivers, mountains, a tropical rainforest, coral reefs, wildlife and a rich past are all part of the attractions Trujillo has today. Experience the culture, the warmth, the hospitality and the seaside charm of this coastal location. Your time spent in Trujillo will prove to be an unforgettable experience! Christopher Columbus landed in Trujillo on August 14, 1502, during his fourth and final voyage to the New World. It was the first time he touched the Central American mainland. The first Christian mass in the Americas on “terra firma” was held by Columbus in Trujillo. Under Spanish rule Trujillo became the capital of Honduras, but because of its vulnerability it was changed to the inland town of Comayagua and then Tegucigalpa, where it is today. Trujillo was settled in 1524 by Spanish conquistadors under Hernán Cortés. Cristóbal de Olid (1487-1524) is regarded as the town’s founder. Olid was a Spanish adventurer, conquistador and rebel who played a part in the conquest of Mexico and Honduras. The location was strategic for Spanish interests in the New World. The town was destroyed several times between 1633 and 1797, and during the eighteenth century, the Spanish abandoned Trujillo because it was deemed indefensible. Trujillo and its citizens were subject to frequent pirate attacks throughout the 17th and 18th centuries. Due to the gold and silver mined by the Spanish in the interior of Honduras, pirates were often drawn to this quiet bay. The largest gathering of pirates in history took place in the vicinity in 1683. 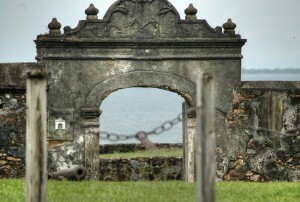 The Fortaleza Santa Barbara de Trujillo (Santa Bárbara Fort) was constructed around 1575 and provided protection for the town with its large cannons overlooking the Bay. A town plaza and park are near the fort, as is the iconic San Juan Baptista Church. The remains of the British, French, and U.S. consulates are within walking distance and provide interesting tour stops. The mercenary William Walker, who had seized control of neighboring Nicaragua, was caught and handed over to the Honduran authorities in Trujillo, and executed by firing squad on September 12, 1860. Walker was 36 years old and is buried in the Cementerio Viejo (the Old Cemetery), in Trujillo. American author O. Henry (William Sydney Porter) spent about a year living in Honduras, primarily in Trujillo. He later wrote a number of short stories that took place in “Coralio” in the fictional Central American country of “Anchuria”, which was based on the real town of Trujillo. Most of these stories appear in his book Of Cabbages and Kings. Trujillo is home to the local Garifuna culture which is well known for its unique dances, food and traditions. On February 20th, 1797, a total of 2,248 Garifunas along with stored food supplies were set aboard ships headed toward the Honduran Coast and Bay Islands. The Garifunas arrived in Trujillo, Colon (Honduras) on May 17th, 1797. In 2001 UNESCO proclaimed the language, dance, and music of the Garifuna as a Masterpiece of the Oral and Intangible Heritage of Humanity in Honduras, Nicaragua, and Belize. Their housing consists of small huts with walls made of royal palm, sugar cane and cement blocks. Most Garifunas not only speak Spanish, but also use the Igñeri dialect that is a combination of Arahuaco, French, Swahili, and Bantu. One interesting feature of Garifuna is a vocabulary split between terms used only by men and terms used only by women. The terms used by men generally come from Carib and those used by women come from Arawak. Almost all Garifuna are bilingual or polylingual, speaking the official languages of the countries they inhabit such as Spanish and English most commonly as a first language. There is a wide variety of Garifuna dishes, including the more commonly known ereba (cassava bread) made from grated cassava, garlic, yucca, and salt. This is done in an ancient and time-consuming process involving a long, snake-like woven basket (ruguma) which strains the cassava of its juice. It is then dried overnight and later sieved through flat rounded baskets (hibise) to form flour that is baked into pancakes on a large iron griddle (Comal). Others traditional dishes include: machuca (mashed green plantains with coconut milk soup and fried fish), banana bread and pumpkin bread. Garifuna music is quite different from the rest of Central America. The most famous form is Punta. Its associated musical style has the dancers move their hips in a circular motion. 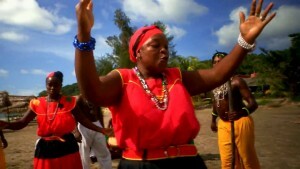 Punta is the most popular dance in Garifuna culture. It is performed around holidays and at parties and other social events. Punta lyrics are usually composed by the women. Trujillo, Honduras provides ample opportunities for outdoor exploration. Featuring one of the largest rain forests found north of the Amazon River Basin. This country is home to interesting and beautiful plants and animals. Thanks to its location at the heart of the tropics, Trujillo is host to a myriad of species of plants and animals. The Honduran National Flower is the orchid Rhyncholaelia digbyana, an indigenous plant of Honduras. The mountain range hosts a combination of evergreen forest and tropical rain forests. Mangrove swamps, lagoons and palm tree forests line the coastal regions. Massive trees like Ceiba, or Kapok tree, can be found throughout the Honduran rainforests. These trees can grow up to 200 feet and live to be more than 200 years old. A single tree provides a home for countless animal species. Birds feed and nest high in the tree’s branches, mammals move through the forest on these branches, and amphibians and insects live among the leaves and other plants growing on the tree. The rainforest is home to a wealth of biodiversity. Scarlet macaws, tapirs, butterflies, white-tailed deer, jaguars, toucans, sloths and armadillos are just some of the many animals that depend on the rainforests here for food and shelter. Toucans, parrots, and swallows make up just a fraction of the over 700 species of birds that have been spotted in Honduras. 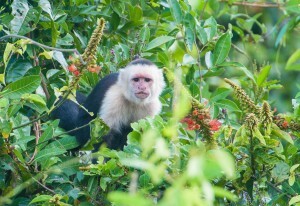 Monkeys are one of the most popular of Honduras wild animals. Three species of monkey live in Honduras: the white-faced monkey, spider monkey, and howler monkey.